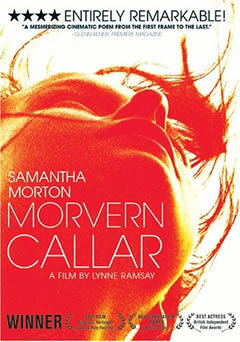 DVD Synopsis: Academy Award nominee Samantha Morton (Sweet and Lowdown, Minority Report) is the mysterious Morvern Callar. Waking up Christmas morning, Morvern is greeted with a startling surprise; her boyfriend has inexplicably committed suicide. He has left her a cryptic short message on his computer screen – "I love you. Be brave." He has also left her the manuscript for a new novel. Impulsively, Morvern changes the authors name to her own and sends the novel out to publishers. This then begins a rebirth of a character free for self discovery. Morvern Callar works on the assumption that an audience will accept the title character’s behavior after she finds her boyfriend dead on the floor, which is, admittedly, a difficult thing to do. Take that first night after Morvern has made the gruesome discovery; instead of calling the authorities, she dresses up and goes clubbing with her friends, leaving the body lying right where she found it on the kitchen floor. And yet, thanks to Samantha Morton, whom I rank as one of today’s finest actresses, we do learn to tolerate Morvern Callar, faults and all. Both Morton and director Lynne Ramsey succeed in taking us past this character’s questionable actions, exploring instead the root of her motivations. Ultimately, Morvern is a young woman who wants to break free, to leave behind her old life and start fresh, and she goes about doing so the only way she knows how. It’s easy enough to sit back and judge Morvern Callar (especially when she uses the money her boyfriend set aside for his funeral to pay for a vacation on the Spanish Coast), but it’s something else altogether to recognize why she acts this way. Morton and Ramsay work at building a base for this character, and then branch out in multiple directions, affording us the enviable opportunity of acting as co-pilots on Morvern’s journey of discovery.